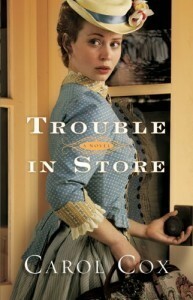 In TROUBLE IN STORE, author Carol Cox’s latest novel, out-of-work governess Melanie Ross is forced to pursue her last resort: a dusty Arizona mercantile she inherited from her cousin. But local shopkeeper Caleb Nelson is positive he inherited the mercantile, and he’s not about to let some obstinate woman with newfangled ideas take over. His solution? Marry her off–to someone else–as soon as possible! Then a sinister force brings mystery and murder to their doorstep, and this unlikely pair must band together to survive the trouble in store. To celebrate the story, author Carol Cox and Bethany House Publishers are pleased to announce the MERCANTILE MYSTERY SWEEPSTAKES, and your chance to win one of three marvelous prizes! This giveaway starts June 3, 2013 and ends June 20, 2013 @ 11:59 pm (PST). Winners will be selected Friday, June 21, 2013, and announced right here on the site. Melanie causes all kinds of trouble in Caleb’s rough-edged mercantile, especially when she stocks the shelves with expensive, blush-colored china, rather than the usual tools and farm supplies! Our Grand Prize winner will receive their very own set of Melanie’s fancy china: a vintage, Royal Standard cup and saucer set, service for four. In Trouble in Store, the mystery of a beautiful music box causes sparks to fly between Caleb and Melanie. Our Second Prize winner will have the chance to win an elegant music box, just like the one in the story. This hand-made Italian music box is made of inlaid layers of walnut and rosewood, and plays Melanie’s favorite tune, “Liebestraum”. The townspeople of Cedar Ridge come to Ross-Nelson mercantile for supplies, advice, news, and best of all, fresh-ground coffee! Caleb grinds Arbuckles coffee beans as a service for his regular customers. Our Third Prize winner can enjoy their very own, 1880′s hand-ground coffee, with this antique grinder, Arbuckles coffee, and a pair of Cowboy and Cowgirl mugs. Go to http://authorcarolcox.com/giveaways/ and completed the entry box, anytime between June 3 and June 20.